Our trip to Myanmar was definitely an absolute highlight. 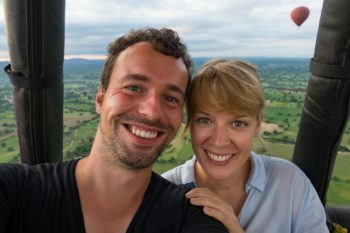 We spent a month in this wonderful country, visiting great places, and meeting many really sweet people. In this post, we’ve written down everything, and we mean absolutely everything you need to know before and during your Myanmar trip. Whether you’re traveling as a backpacker or joining a guided tour group. 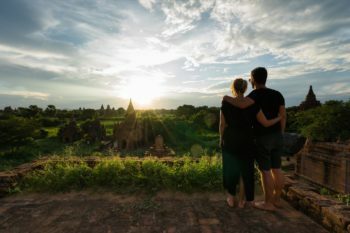 Our Myanmar travel tips for planning your trip and practical information for your time there are designed to be helpful for everyone. Since we really packed as much information about Myanmar as humanly possible into this post, it’s turned out pretty long. So we’ve placed a table of contents at the beginning of the post to help you navigate straight to the most relevant sections for your trip. You’re not completely sure if Myanmar is the right choice for sure? Then this section is perfect for you. We’ll show you what you can expect to see and experience in Myanmar. Who is Myanmar perfect for as a destination? Myanmar has an incredibly impressive culture and isn’t known as the land of temples and pagodas for nothing. If you like visiting temples, whether new or ancient, then there’s probably no better destination in the world than Myanmar. Of course the country has a lot more to offer: impressive landscapes for example. Myanmar shows off its most scenic side in Shan State and around Inle Lake. 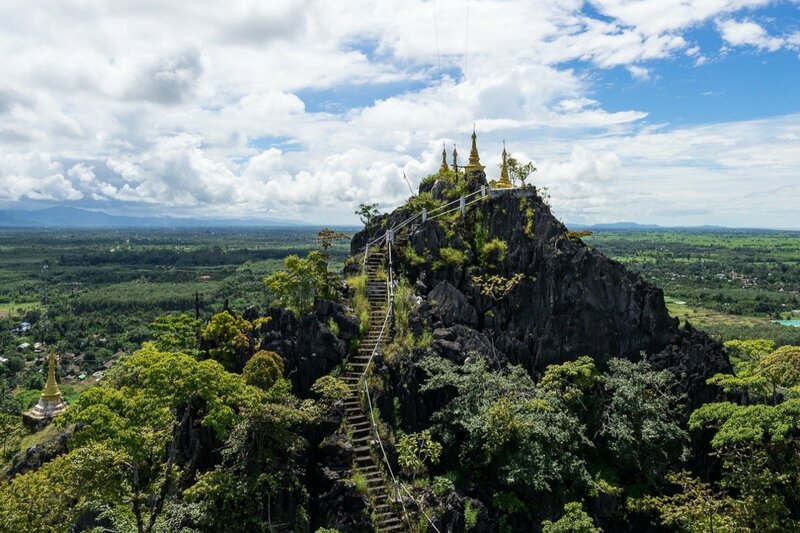 If you’re into hiking, then Myanmar should be right up your alley. And after a heavy dose of culture, a few days of relaxing by the beach makes for a nice change of pace. Myanmar also has a lot to offer in this respect: In the west and south of the country, there are long sandy beaches to round off a perfect trip to Myanmar. But Myanmar definitely isn’t a destination where you just go for a beach holiday. There are countries in the region that are much more suitable for that, take Thailand for example. Myanmar also probably isn’t for for you if you can’t make do without Western food and a Western standard of living. If you’re willing to pay a higher price, then you’ll find that there too. But you should still always be aware that tourism in Myanmar is still in its infancy. Traveling around the country is easy, but you can’t just buy pizza and burgers on every corner. Public transport can be uncomfortable and it can take a long time to get from one place to the next. When’s the best time to travel to Myanmar? The main season for traveling to Myanmar is from November to February. It’s pleasantly warm then (25 to 30 degrees), but not too hot, and the probability of rainfall is very low. That’s definitely the most pleasant time for a trip to Myanmar. But you won’t be alone – tourists visit Myanmar in drove during peak season. So it’s generally much more crowded, and hotels in the major tourist hot spots jack up their prices accordingly. If you’re a backpacker on a tight budget, then you might want to avoid the main travel season from November to February. The so-called shoulder season is a good alternative. From mid-September onwards, it rains less and less and the temperatures are also mostly in a bearable range. We visited Myanmar in October and only really had two rainy days while we were there. There were quite a few days when it didn’t rain at all, and when it did, it only lasted for 1 to 2 hours. Myanmar is astonishingly green during this time because of the months of rain that preceded it. And it’s not quite as crowded yet, so traveling is still pretty easy-going. We can definitely recommend October for your trip to Myanmar, even though you might have to brave the rain every now and then. Starting in March, it gets very, very hot in Myanmar. Temperatures over 40 degrees Celsius are pretty common and unless you stick to air-conditioned vehicles, traveling isn’t much fun. It depends a lot where you want to go though – if you’re headed for the mountain ranges in the east and the north of the country, then this is probably the best time. Because it gets pretty chilly there during peak season. The rainy season runs from June to August and it’s not uncommon for it to rain non-stop for days at a time. But hey, at least you won’t have to share Myanmar with that many other travelers. 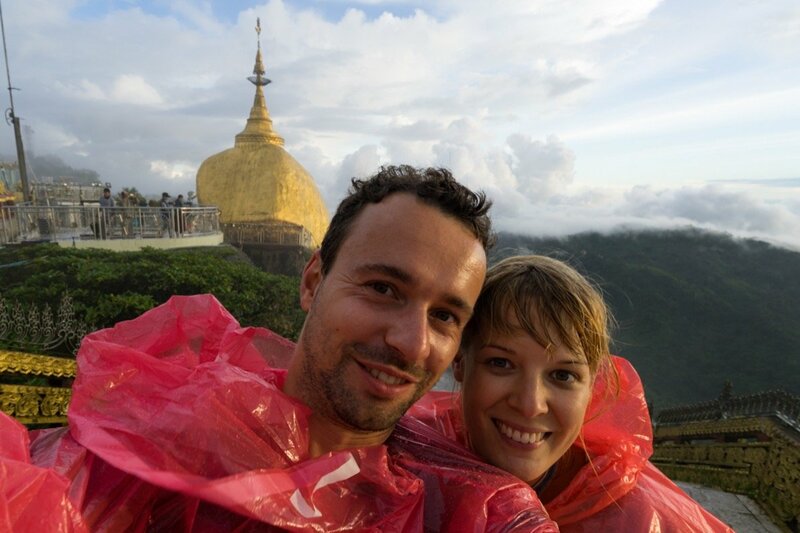 We finally made it to the top of the Golden Rock – wet, but happy. It rained in torrents the whole way up and the mountain was completely shrouded in clouds. Just when we reached the top, it stopped raining and the cloud cover dispersed. Lucky us! Myanmar has a huge number of sights and attractions to offer. This post would go on for days if we tried to list them all here. Nevertheless, we’d like to briefly introduce you to some of the major sights in Myanmar. For many of the sights, we’ve added links to more detailed posts featuring additional information and a lot more photos, so check those out if you want to know more. We also always tell you the minimum time we think you should plan for each location, and how long we’d recommend staying in order to get the full experience. 1 day means one full day, i.e. two nights in total. 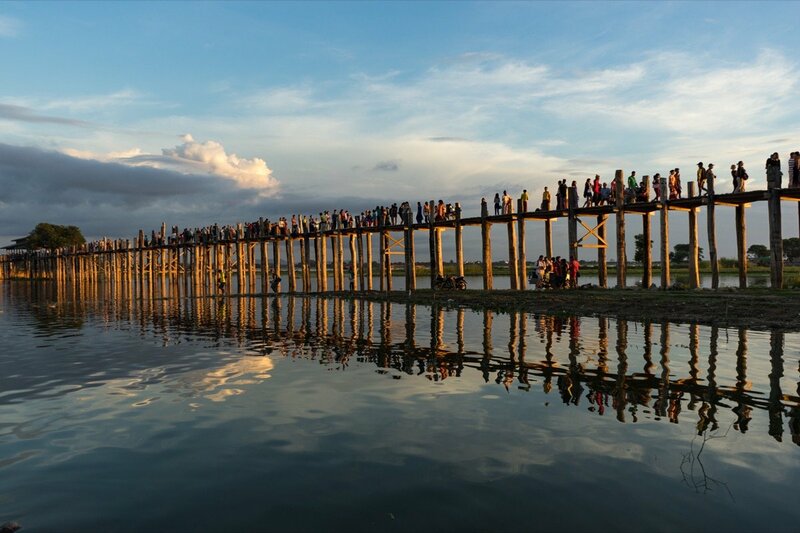 Almost all travelers visit Yangon, Mandalay, Bagan, and Inle Lake, but there’s plenty of other places to discover. The former capital of Myanmar is still the cultural and economic heart of the country. 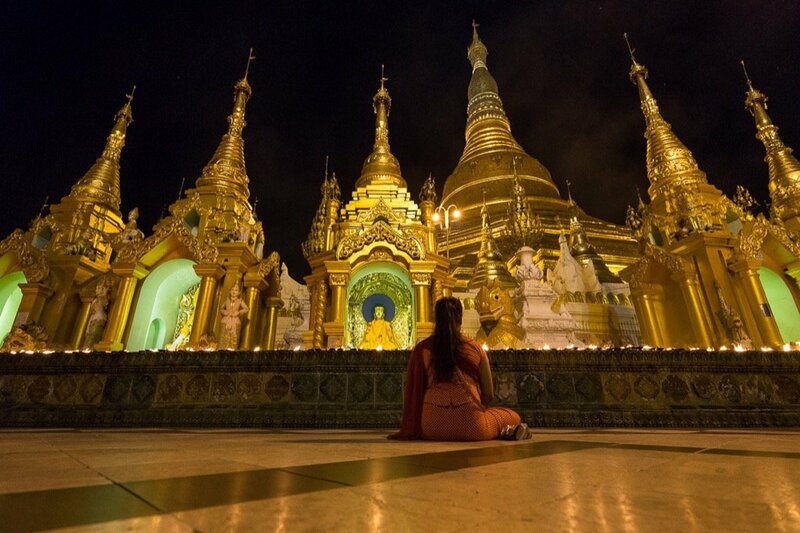 The Shwedagon Pagoda is one of the absolute highlights of any Myanmar trip. The Shwedagon Pagoda is a really serene place. Bagan is definitely an absolute must-see on any trip to Myanmar. The city of over 3,000 temples and pagodas is completely unique worldwide and will take your breath away. Mandalay is the second largest city in the country after Yangon and the cultural center of the north. The city itself doesn’t have that many sights of its own, causing many travelers to skip it entirely. That’s a mistake though because the area around Mandalay has a lot of great sights to offer: Inwa, Amarapura, Sagaing, Monywa (not a very well-known destination, but really great), Pyin U Lwin, Mingun. Mandalay is the ideal starting point to visit all these places. Monywa and Pyin U Lwin are a bit further away, so you may want to consider whether to stay the night or just go on a day trip from Mandalay. Inle Lake near Bagan is the second major tourist stronghold in Myanmar. There’s an infinite number of hotels and masses of western food there. We don’t really consider Inle Lake an absolute must-see and so we skipped it on our last trip. 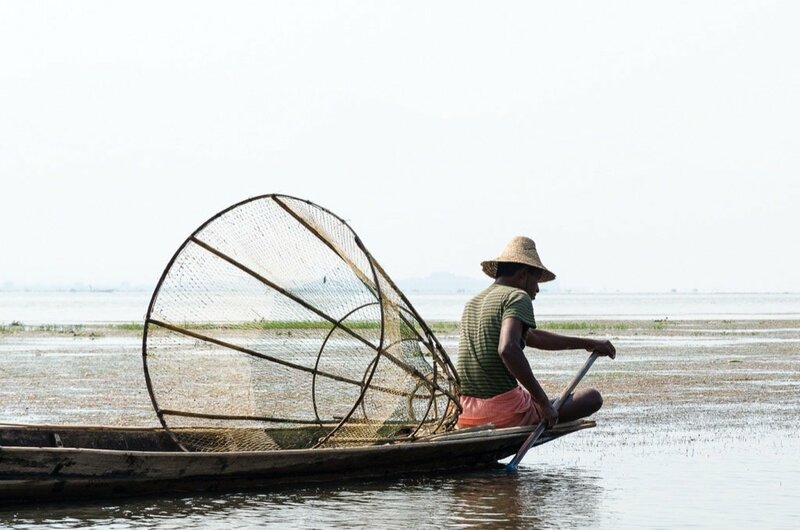 The Inle Lake fishermen are among the most popular subjects for photography in Myanmar. Bago is just two hours from Yangon and is often underestimated as a destination. The small town has a huge density of impressive temples and pagodas. 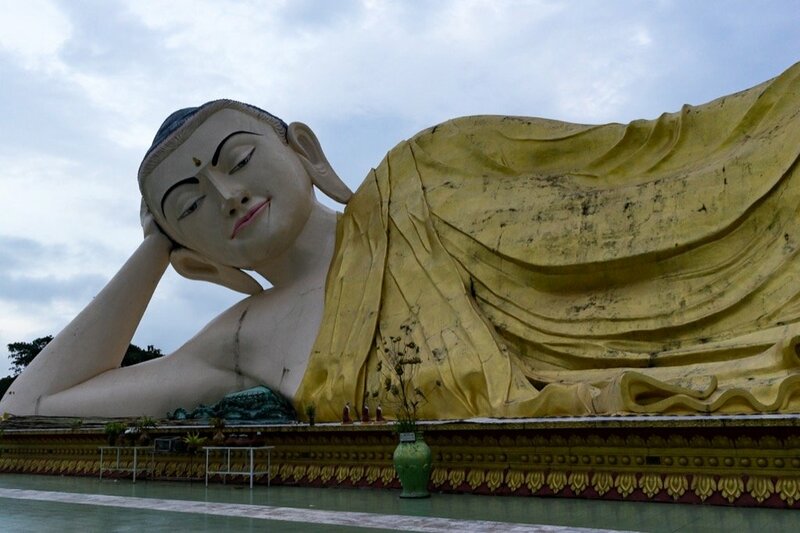 Bago makes for a great stop on the way to or from Yangon when you’re heading south or north. 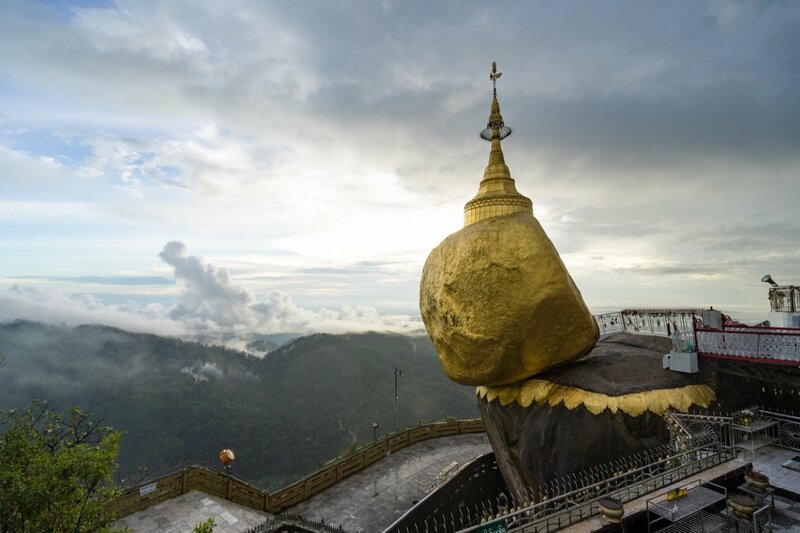 The Golden Rock is one of the most important pilgrimage sites in Myanmar and makes a great subject for photos. If you take a truck to the top, one night should be long enough. If you want to hike up by yourself, you’ll need two nights. Hpa-An itself is just a small sleepy town without much to see. But the area around it more than makes up for that. There are countless caves and stunning landscapes to explore. 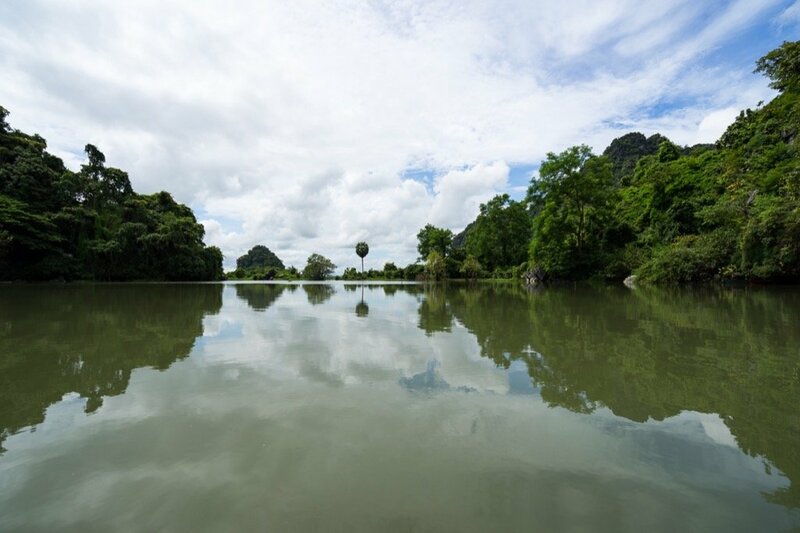 The countryside around Hpa-An is beautiful. Mawlamyaing in the south of the country has a very unique flair. The city really appealed to us with its many old colonial buildings, and the area around Mawlamyaing has a lot to offer too. The Kyauk Ta Lone Pagoda near Mawlamyaing is still a well-kept secret. Mrauk U in the north-west of Myanmar is still a bit of an insider tip. Not many travelers venture out into this area, at least in part because it’s so far off the beaten path that it’s hard to get there. Nevertheless, the old royal city with its many temples and pagodas is an absolute highlight. Really beautiful up there, right? Of course that isn’t all there is. But if this is your first time in Myanmar, these sights should be more than enough to keep you busy on your trip. If you want to go hiking, you should also check out Kalaw and Hsipaw – they’re great starting points for multi-day trekking tours. The Irrawaddy Delta to the southwest of Yangon is another interesting destination that doesn’t get as many tourists. And let’s not forget the beaches. Myanmar isn’t the type of country where you just go for a beach vacation. Still, there are some excellent beaches there for a few relaxing days at the end of your trip: Ngapali Beach and Ngwe Saung in the west of the country and the still barely-known beaches and islands in the deep south of Myanmar around the towns of Dawei and Myeik. Or are you interested in precious stones? Then the ruby capital Mogok in the northwest of the country might be worth your time. Mogok in the north of the country is still a well-kept secret. You’ve already decided to go to Myanmar? Great. You won’t regret it. 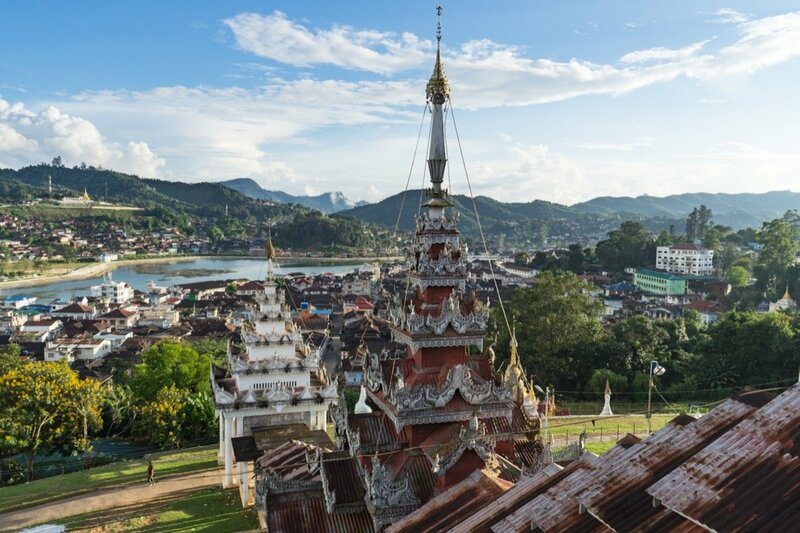 This section has all you need to know about booking your trip to Myanmar. Myanmar has three international airports. Almost all travelers begin their Myanmar holiday in Yangon, home to the country’s largest airport. There aren’t any direct flights from Europe to Yangon yet. Emirates is currently the best and cheapest carrier flying to Myanmar. You can fly to Yangon from several European airports with a stopover in Dubai. The Emirates website always offers the best prices, so you can book straight from the source without having to worry about comparing prices on other sites. Alternatively, you could also take the opportunity and stop off in Bangkok, Kuala Lumpur, or Singapore on your way to Myanmar. There are regular connections to Myanmar from all of these cities. We like flying with Air Asia, which usually offers the best prices for flights in the region. More and more accommodations have set up shop in Myanmar in recent years. That’s also really necessary because many hotels are fully booked during peak season. That’s why we strongly recommend booking your accommodations in advance. There are hotels in all price and comfort categories – from simple backpacker hostels for less than 20 dollars per night to luxury hotels for 200 dollars or more. Basic mid-range hotels charge between 30 and 60 dollars per night. For that price, you can expect a clean room with a relatively comfortable bed, air-conditioning, and a warm shower. Breakfast is always included in Myanmar, and it usually consists of toast, egg, jam, and a few pieces of fruit. We stayed at a lot of different hotels during our one-month tour of Myanmar and so we’ve compiled a whole bunch of tips on where to stay in Myanmar’s major tourist destinations. Many travelers feel more comfortable booking a fully organized trip through Myanmar. We prefer traveling on our own terms, but of course there’s no reason why you shouldn’t travel that way. If you choose an organized trip, you can forgo all the planning and you’ll be sure to see the most important sights the country has to offer. You’ve booked your trip to Myanmar? Excellent! But there are still some things you need to do before you leave. 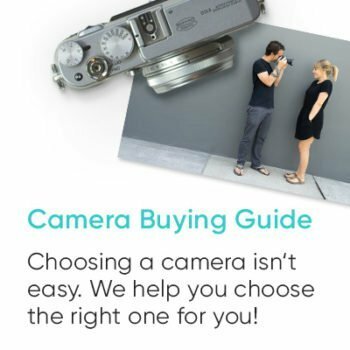 We tell you the things you need to remember in this section. You’ll need a visa to enter Myanmar, but getting one is pretty straightforward. You can stay up to 28 days in the country with the visa. When you enter, your passport has to be valid for at least another six months. There are two different ways to apply for a visa to Myanmar. The most convenient way is to apply for an eVisa online. You can do so on the website http://evisa.moip.gov.mm/ . All you have to do is fill out the application online, upload a biometric passport photo, and your visa will be emailed to you within three days at the latest. You have to print out the visa and show it at immigration. The eVisa costs 50 dollars, which you have to pay via credit card when you apply. The visa is valid for 90 days, that means you have to enter the country within the next three months. So don’t apply too early. If you don’t want to apply for your visa online, you can also do it the traditional way by mail or in person. In that case, the visa only costs 25 euros. You have to send your passport and the application form to the Embassy of Myanmar in your country and you’ll receive everything back after about two weeks. Check the embassy website in your country for the application form and any further information. You probably shouldn’t cut it too close because you never know how long it will actually take to process. If you live near an embassy, you can also go there in person to apply for your visa. But you’ll have to go twice because your visa won’t be issued right away. If you’re traveling in Southeast Asia for a long time, you can also visit the Myanmarese Embassy in one of the neighboring countries. Officially, there are no visa extensions for Myanmar. But if you want to stay in the country for longer than 28 days, you can just overstay. When you leave, you should see a special counter at the passport control marked ‘Overstay’. They’ll charge you a fee of 3 dollars for every day you overstayed your visa. We did that ourselves and stayed in Myanmar for a total of 33 days. Turns out we were lucky though, because the official at the airport told us that eVisas generally aren’t eligible for overstays, only regular tourist visas. They let it slide in our case and everything worked out ok. But if you know for sure that you want to overstay, then we’d still recommend applying for a regular tourist visa. You never know, you might end up with an official who isn’t quite as lax with the rules. We’ve heard from different sources that you can overstay your visa for up to 90 days without a problem. And that may be true, but we would still urge you to make sure the laws haven’t changed before your departure. That kind of thing can happen fast in Myanmar. If you’re looking for a good read while you’re in Myanmar, we recommend the book The Glass Palace by Amitav Ghosh. A truly captivating novel that unfolds over several generations, all set against the backdrop of Myanmar and other countries in the region. Most of the time, you’ll be wearing light clothes in Myanmar. But you should make sure to bring a warm sweater for air-conditioned buses or chilly nights. Sleeveless shirts and extremely short pants are very uncommon in Myanmar and are prohibited in temples and pagodas. Shorts should go past the knee line and your shoulders should always be covered. You should keep that in mind when choosing which clothes to take and leave your spaghetti tops, shorts, and dresses at home. Since you have to take off your shoes before entering temples and pagodas, the ideal footwear for Myanmar is flip-flops and sandals that you can just slip on. You don’t need a power adapter for Myanmar if you’re on the European system. Normal European plugs fit into any outlet. Something you really need to bring along is sunscreen. It’s hard to find in Myanmar and if you do happen to come across a bottle, it’s usually very expensive. And another tip for women: Tampons are also hard to get in Myanmar. The only options are the branches of City Mart in Yangon and Mandalay. And they only stock mini-tampons. 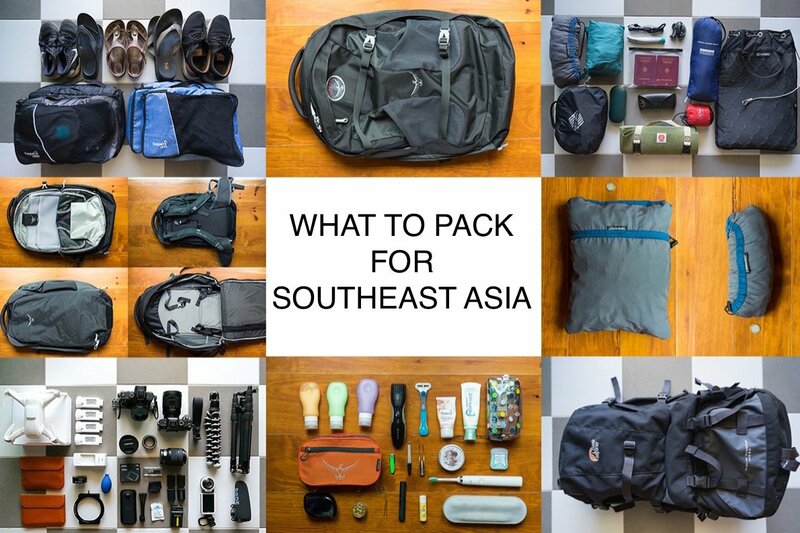 If you need some more tips on what to pack, then check out our list of what to pack for Southeast Asia. We’ve listed the complete contents of our backpack there and tell you all about our favorite travel accessories. Our list makes backpacking child’s play, although we don’t really regard ourselves as backpackers in the traditional sense of the word. 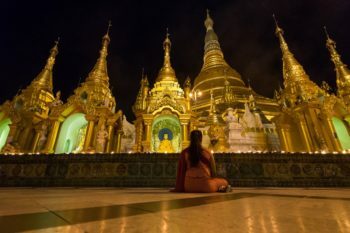 Before you pack your suitcase or backpack, you should also read the paragraph on how to conduct yourself in Myanmar at the end of this post and pick your wardrobe accordingly. This is what we have in our bags when we’re out traveling in Southeast Asia. 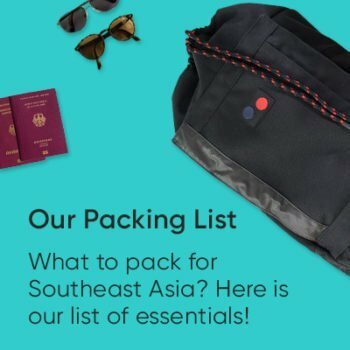 Our list of what to pack for Southeast Asia has lots of great tips and tricks for your trip to Myanmar. Unfortunately, medical care in Myanmar isn’t particularly advanced yet. English-speaking doctors are few and far between and the medical facilities at hospitals and clinics aren’t all that good. If you get seriously sick, it’s still generally recommended to travel to Bangkok or Kuala Lumpur for treatment. The basic vaccinations recommended for Europe are generally good enough for Myanmar. Just check to make sure you’re vaccinated against tetanus, diphtheria, and hepatitis A. If you’re traveling to more remote areas or belong to a risk group, you should consider getting vaccinated against rabies, Japanese encephalitis, typhoid, cholera, and hepatitis B. Consult a doctor or a tropical institute before you leave. Keep in mind that vaccinations may take several weeks or even months to take effect, so don’t leave them until the last minute. Malaria is still a problem in Myanmar, especially in the rainy season. In tourist areas, the risk is much lower. We didn’t take any malaria prophylaxis and considering the substantial side effects, you should really think twice about whether it’s necessary or not. If you plan to travel during the rainy season or to very remote areas, you should get some more information and consult your doctor. Dengue fever is also prevalent in Myanmar. Unfortunately, there’s no way to vaccinate against it. Regularly applied mosquito repellent and a mosquito net are the best precaution against dengue fever and malaria. Mosquito spray or mosquito cream is widely available in tourist areas and it’s much cheaper than in Europe. Outside the tourist areas, however, it can be difficult to get hold of any. Pharmacies are everywhere in Myanmar, and most drugs are readily available there and very cheap. You even get antibiotics without a prescription. Be that as it may, we still recommend putting together a basic health kit for your journey. Communicating with pharmacists can be tricky and there’s no telling if you’ll be able to get what you need when you need it. Our travel health kit in our packing list should give you a good idea of what to take. Unless you boil it, you can’t drink the tap water in Myanmar. It’s even recommended to use bottled water for brushing your teeth. But we didn’t go that far and brushed our teeth with tap water. And we survived anyway. Food poisoning and stomach upsets are the most common health problems among travelers in Myanmar. You can never completely rule it out, but at least you can minimize the risk. Don’t buy any sliced ​​fruit (e.g. watermelons) and avoid raw ingredients (e.g. lettuce leaves) in simple restaurants and at street stalls. We ate at simple restaurants a lot of the time and never had any problems. The culprits are often to be found elsewhere anyway. Many stomach issues are caused by Western food, as the locals aren’t as familiar with the ingredients and how to prepare them, so they get it wrong sometimes. 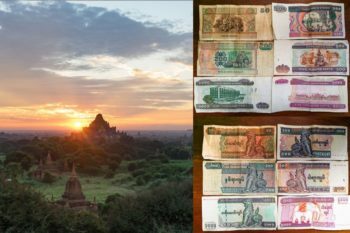 Money in Myanmar is an issue that a lot of travelers are concerned about. There have been quite a few changes in recent years, so a lot of the information you’ll find online is outdated. That’s why we want to shed some light on the situation. The official currency in Myanmar is the kyat. 1000 kyat are equivalent to about € 0.70. The most common bills come in denominations of 50, 100, 200, 500, 1000, and 5000 kyat. So be prepared to carry around a big bundle of money. There’s a vast network of ATMs nowadays where you can withdraw a maximum of 300,000 kyat at a time. You can can withdraw money using a Visa or Mastercard. Local ATM providers levy a service charge between 5,000 and 6,500 for each withdrawal. Your own bank may also charge you a fee for withdrawing money abroad. Due to the low withdrawal limit you can end up paying a lot in fees. For a long time, US dollars were the most important currency in Myanmar. That’s no longer the case and you can really pay for everything in kyat. Hotel bills and airline tickets are still listed in US dollars on the invoice. But you can pay for everything in kyat. It’s still never a bad idea to have a few dollars or euros in cash on you, just in case. That’s always good to have as a reserve. Every bank and quite a few hotels will exchange money for you. But dollar bills have to be in absolutely pristine condition, otherwise they won’t be accepted. Even a small crease or slight wear is enough and you won’t be able to get rid of the bills. They’re not quite as strict with euro notes though. People often refer to Myanmar as an expensive destination, but we honestly can’t confirm that. In the post we linked to above, we’ve provided a detailed breakdown of our total travel expenses for Myanmar. This is what bank notes in Myanmar look like. Of course we also have some practical tips and information for when your trip to Myanmar finally gets going. Some of the distances in Myanmar are very far and traveling over land isn’t always a comfortable experience. We’ll tell you the best way to get from A to B in the following section. Buses are the most important way to get from one place to another in Myanmar. There are several bus companies operating between the most important tourist locations in the country. Prices are low and range from a few euros for short trips to about 15 euros for long trips on the night bus. Your best bet is to always purchase tickets locally. Every hotel we stayed at also offered bus tickets and the prices were generally very fair. 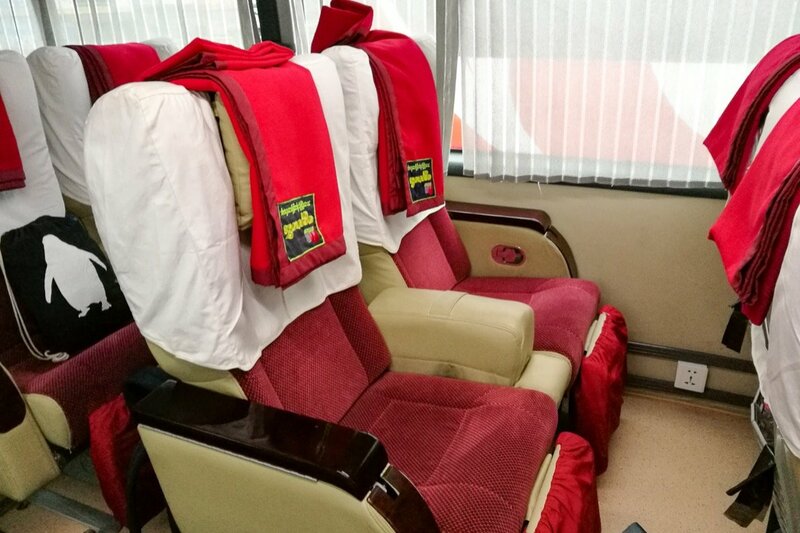 Especially for long distances, you should always make sure to book a comfortable bus. The vehicles generally referred to as ‘2+1’ buses only have three seats per row, are super-comfortable, offer lots of leg room, and some of them even come with a built-in on-board entertainment system with a selection of films embedded in the seat in front of you. These buses are only slightly more expensive than regular buses, but infinitely more comfortable. But be sure to book them a few days ahead. On longer routes, you have the choice between day and night buses. If you take a night bus, you can save yourself an overnight stay. But many of them arrive at their destination at the crack of dawn, sometimes as early as 4 in the morning. Traveling by train in Myanmar is a real experience, but long journeys are really only recommended for absolute train-lovers. The trains are slow, uncomfortable, and chronically late. We recommend taking the train for a short trip, just to have had the experience. The Yangon – Bago route is ideal for this because the train only takes about 2 hours. For longer distances, trains are actually a bit cheaper than buses, but they often take several hours longer, and sometimes even twice as long. Traveling by train in Myanmar is a real experience. The fastest way to get from A to B in Myanmar is to take one of the numerous available domestic flights. 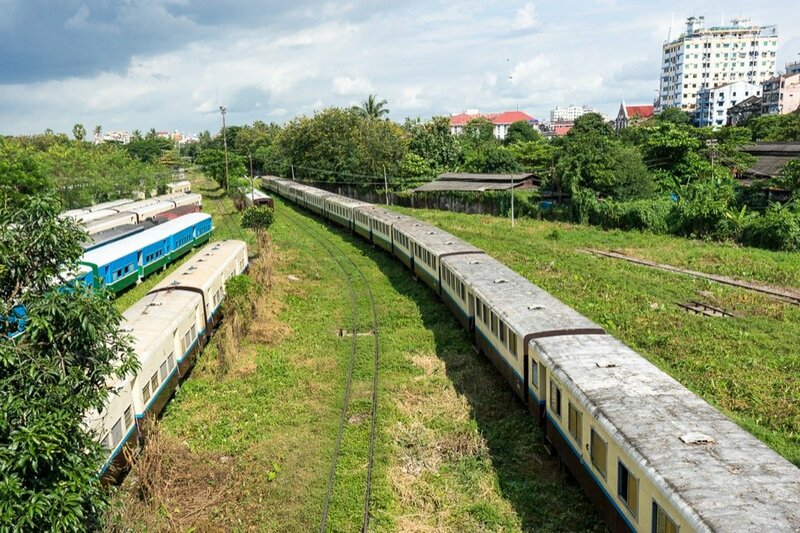 From Yangon, you can get to almost every destination in the country within an hour. But there are much fewer connections between cities other than Yangon. The prices for domestic flights are stable at about 80 to 120 euros per route and don’t really change much, whether you book several weeks in advance or the day before your flight. Online bookings are available now for Air KBZ and Air Mandalay. Otherwise, the most common way to book is with travel agencies or at your hotel. That’s usually fast and hassle-free. It’s also possible to make your own way around Myanmar with a private driver. Depending on the distance and difficulty of the route, this will cost you between 100 and 500 dollars. Private drivers are also most easily found locally. Your hotel should be able to hook you up. There are several options for short distances Pick-up trucks with passengers packed onto the cargo beds are commonly used for short distances between two locations. A ride in the back is definitely an experience. There are taxis in all the major cities. They don’t have meters, so you have to negotiate a fixed fare before your ride. The same goes for tuk-tuks and motorcycle taxis, which are also available in many towns and cities. Overall, the prices are very fair and you don’t pay huge tourist surcharges. Your best bet is to just ask at your accommodation how much you should expect to pay for your intended route by taxi. 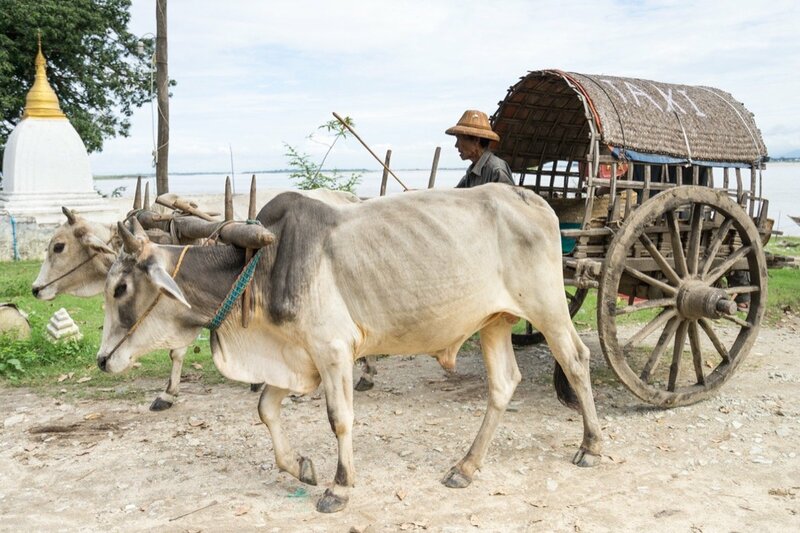 In really remote areas, ox carts are still used for transportation. That isn’t really much faster than walking. But hey, you get to ride on an ox cart! Who can say they’ve ever done that? Most travelers arrive at Yangon Airport. There’s a taxi stand in the arrivals hall where you can tell them your destination. They’ll quote you a fare and then assign you to a taxi driver. A trip to the city will cost you about 7,000 kyat, and depending on the traffic, it’ll take you between 30 and 90 minutes. If you fly to Mandalay, you’ll also have to take a taxi. It costs 12,000 kyat for a ride to the center of the city. 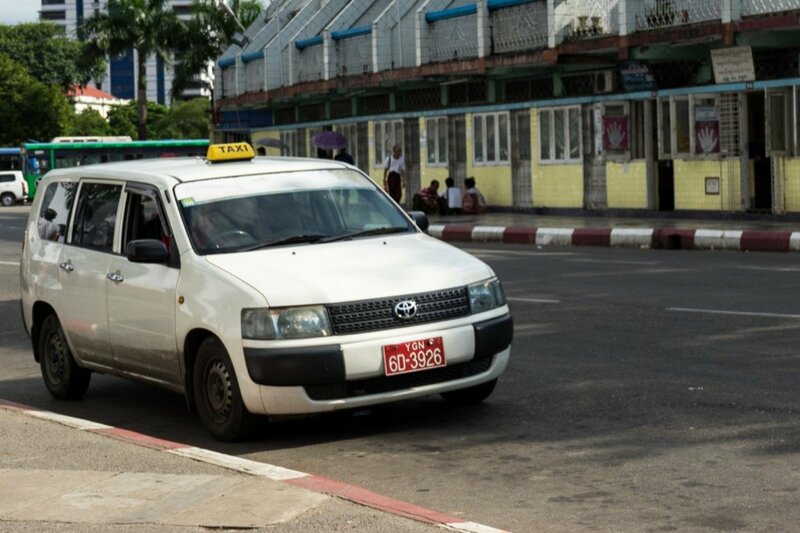 Taxis are the most important means of transport for travelers to Yangon, in fact there’s no alternative at the airport. Food in Myanmar is very varied and delicious. The cuisine is influenced by Thai, Indian, and Sri Lankan cooking, but it still has its own, very individual style. Curries are a staple of local cuisine, but don’t confuse them with the Thai variety. Simple restaurants are have often several pots with different curries based on meat, fish, or vegetables. First you choose one or more, and then you get to choose from a vast selection of side dishes. Very tasty and very cheap! Each region also has its own specialties. The Shan noodles from the eponymous state are very well-known and tasty, and they’re available in several forms in salads or soups. 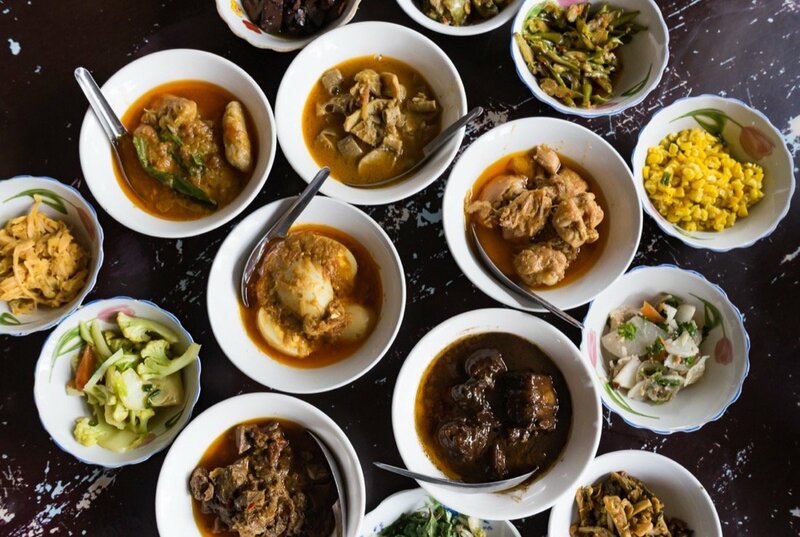 The Kachin cuisine with its very special curries and the northwestern cuisine of Rakhine State, which is much spicier, are very delicious in their own right. Mohinga is another very popular dish. It’s is a fish soup with noodles that the locals mainly eat for breakfast. Hotels in Myanmar generally always include breakfast. With the exception of luxury hotels, they all offer the same: toast, fried eggs, jam, fruit. If you’re lucky, you might get pancakes too. Alternatively, many hotels also offer local dishes for breakfast. That might not be for everyone, but they’re usually tastier than the standard breakfast. You can buy water in 1 liter bottles all over the place for a low price. Coca Cola is currently in the process of flooding the country with its soft drinks, so you can buy them pretty much anywhere nowadays. There used to be a local brand called Star Cola, but now it’s completely disappeared from the shelves. The best beer in the country is the appropriately named Myanmar Beer, which is also available everywhere. Even wine is cultivated in the region around Inle Lake. We tried it and it actually wasn’t at all bad. We’ve been told that the local whiskey is pretty decent too. At least we have it on the good authority of some fellow travelers who seemed to enjoy it. You can also get coffee in tourist areas these days. But it’s of greatly varying quality. In more remote areas, all they have is instant coffee, usually ready-mixed with 80% sugar, whitener, and a tiny smidgen of coffee. This is what a normal meal at a local restaurant looks like. Price per person: 3.000 kyat (2 euros). Tipping is rather uncommon in Myanmar. No one expects tips at simple restaurants or street food stalls. If you leave some money on the table, they might even run after you and try to give you back your change. Taxi drivers don’t expect a tip either. Many hotels will have someone carry your suitcase or backpack to your room, and not just in expensive hotels. We never had the feeling that they expected a tip. Most of the time, the impromptu bellhops disappeared so quickly that we had no way of giving them anything anyway. But that might be different in very expensive hotels. Porters at bus stations or ports, on the other hand, usually expect a small tip. About 500 kyat is a reasonable amount. Tipping is appreciated in more up-market restaurants. If the check is placed in a folder, then that’s a good sign that they’d be happy for a tip. Then again, a service charge is already included in many expensive restaurants. Guides also appreciate a small tip or an invitation to dinner. Tips of 3,000 to 5,000 kyat per day are appropriate. We heard so many horror stories about the Internet in Myanmar before we left. So when we got there, we were pleasantly surprised at just how well it worked. Almost all hotels nowadays offer WiFi. But connections there really are very bad and rarely strong enough to get anything done. Sometimes it’s good enough for simple things like checking mails or social media. But as often as not, even that doesn’t work. So the magic word is: mobile Internet. Over the past few years, mobile coverage has been expanded throughout Myanmar, so reliable mobile Internet is available almost anywhere these days. We both purchased a local SIM card. That way, we were able to surf the Internet with our smartphones or set up a hotspot for our laptops. The connection is perfectly sufficient for normal work. Even streaming videos often works very well. We even uploaded some of our Myanmar videos using this type of connection, and some of them are almost 1 GB in size. Our tip: We brought a compact mobile WiFi router. It often gets you better reception than just inserting the card directly into your phone. That way, you can use an additional SIM card exclusively for the router. Ooredoo is the best provider for a data SIM. There’s a sales counter right at Yangon airport. But if the line’s too long when you get there, you can get a SIM card at one of the many sales outlets in town. The data packages are very cheap and range from 1 GB for 3,000 kyat (2.10 euros) to 40 GB for 50,000 kyat (35 euros). You can buy top-up credit in many different stores. The red Ooredoo signs are everywhere. We took our drone to Myanmar for its maiden voyage. But at first we weren’t even entirely sure if it was legal to fly it there. The fact of the matter is: There’s currently no drone legislation in Myanmar, but apparently it’s in the works. We flew the drone a few times and never had any problems. Now and then, we also saw a couple of other drone pilots in Myanmar. A few years ago, the authorities weren’t all too pleased to see drones flying about, and there were reports that some pilots had to hand over their drones. As far as we can tell, things have changed since then, but we can’t give you an ironclad guarantee. At least we saw a sign outside the Shwedagon Pagoda in Yangon prohibiting the use of drones on the site. So logically one might assume that it’s allowed everywhere else. But we don’t know anything for certain. Our best advice is not to fly drones in places with crowds of people and of course not near military installations or police stations, and especially not near airports. Myanmar is an altogether very safe country. The crime rate against travelers is very low. Sure, there are some black sheep here and there. But it’s still much more likely for someone to give you back your wallet if you drop it than for someone to rob you. Of course you should at least display a certain degree of common sense. But as long as you keep your head screwed on straight, there’s nothing to prevent you from having a relaxed trip. Although things seem peaceful in the tourist areas, there are still many areas in Myanmar with ongoing armed conflict. These areas are completely taboo for tourists, and you should always be aware of that when you plan your trip. In Shan State in the northeast and Rakhine State in the northwest of the country, there’s still a great deal of unrest, and violent conflicts erupt there from time to time. You can get pretty far with just English in Myanmar. Still, it probably doesn’t hurt to learn a few words in the local language. Myanmar is a very open and tolerant country. The locals are incredibly friendly and welcoming. Unfortunately, the same can’t be said of many travelers to Myanmar, many of whom lack basic manners and respect. All it really takes is to observe a few simple rules while in Myanmar for everyone to get along. In temples and pagodas, men and women should always keep their shoulders covered and wear pants that go at least past the knee line. Annoyingly enough, many people can’t seem to follow this really simple rule. If you don’t want to wear long clothes all day, you can take a shawl with you and put it on before entering a temple. But dressing appropriately is important outside of temples and pagodas too, especially for women. 99 percent of Burmese women would consider a dress that ends above the knee line to be completely beyond the pale. Just as a basic courtesy you should always dress appropriately in Myanmar. For women, that means you shouldn’t wear shorts or skirts that are shorter than the knee line, and no revealing T-shirts or tops. 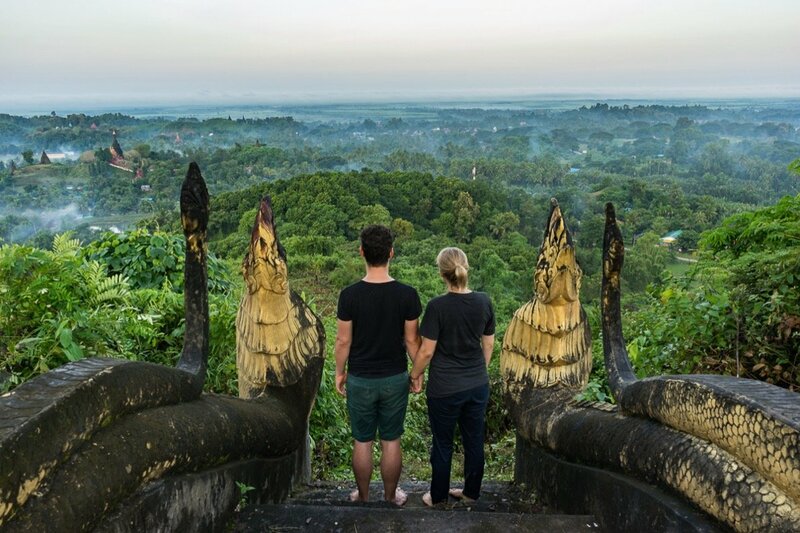 People in tourist centers like Bagan and Inle Lake have gotten used to the sight of lightly dressed tourists by now, but especially in remote areas such as in Mrauk U, you should try to respect local sensibilities. Jenny wore long pants or a long dress for the entire duration of our trip to Myanmar. You have to take off your shoes and socks before entering any of the temples or pagodas. And they make very sure this rule is respected everywhere. Shoes are also removed in residential houses, hotel rooms, and sometimes even in stores. The locals kneel before Buddha statues as a show of respect. If you want to take pictures, you should always make sure to stand behind the worshipers or just kneel down beside them. Generally speaking, most of the locals are happy to have their picture taken. But there are always exceptions and you should respect that. Before we take pictures of people, for example at a market, we always ask them for permission. It’s usually enough to just smile or nod and point at the camera. If someone doesn’t want to be photographed, then of course we respect that. Unfortunately, very few tourists seem to agree. Please try not to be that person. You should never pat children on the head or ruffle their hair in Myanmar. It might be a normal affectionate gesture back home, but it’s extremely disrespectful in Myanmar. And another thing: Don’t ever give children money (if they ask for euros or offer to exchange euros for kyat) or buy something from them. We know how hard it is to say no to a cute kid, but you’re not doing them any favors. Their parents consciously send their children out to beg or sell trinkets to tourists instead of sending them to school because they know that tourists can’t turn down an innocent child. All in all, the locals are very friendly and calm. So it’s not appropriate to raise your voice. Shouting or swearing is seen as extremely rude and will definitely only make the situation worse. 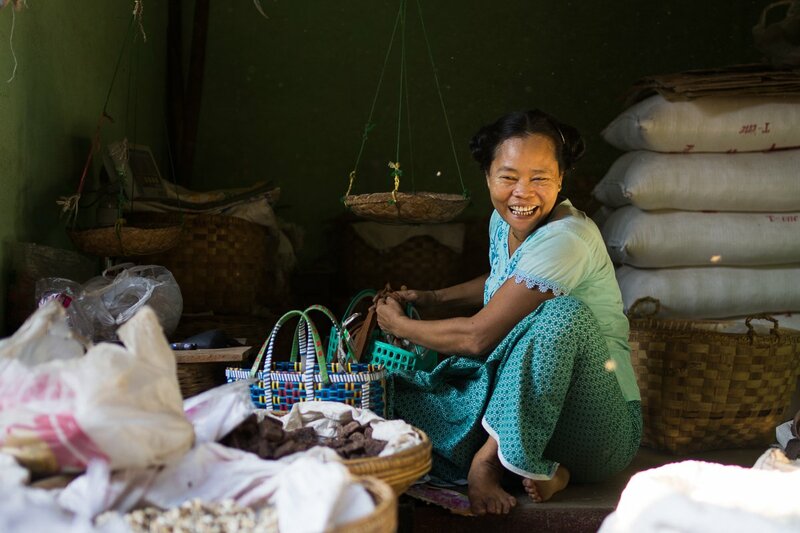 A smile will get you very far in Myanmar. Be friendly to the locals and they’ll be sure to return it in kind. It never hurt anyone to have a smile on their face anyway. This woman’s smile is honest and heartfelt. She was very pleased that we wanted to take her picture. 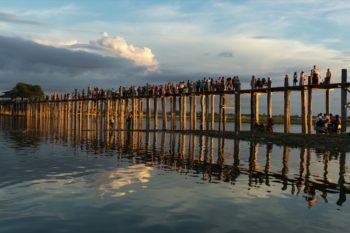 More tips for your trip to Myanmar? Whew, that ended up being quite a long post! We hope it helps you with your planning and preparing your trip to Myanmar. We wish you a great time in this amazing country and hope it will enchant you just as much as it did us. Do you have any questions? Or perhaps you have a tip for us that’s missing in this post? What were your experiences in Myanmar? Please let us know in the comments below! How much does travelling in Myanmar cost?